When choosing software for your tutoring business, it’s important to think big picture. Where do you see your business in the next 5 years, and if your business expands rapidly, will the software be able to handle it? Scalable tutor management software might not be at the top of your priority list when you just get started, but it’s definitely an important consideration. Avoid a situation where you have to manually add thousands of records to a new software program by opting for scalable software right from the start. Teachworks is highly scalable tutor management software that will help you to simplify and automate your education business – regardless of its size. Some of our clients add just a few student lessons to their Teachworks calendar each month, while others add several thousand. Whatever your business requirements, we have you covered. We ran the numbers to give you a better idea of how many lessons, teachers and students some of our bigger clients manage through Teachworks. On average they schedule over 4000 student lessons each month. They also manage more than 1000 active teachers and 2500 active students easily and efficiently. Teachworks offers modular design, allowing you to enable only the integrations and add-ons relevant to your business. This ensures zero clutter and allows you to work more efficiently. As your business expands, you can start incorporating more add-ons to help you simplify admin even more. This is one of the many features that sets Teachworks apart from our competitors. Teachworks currently integrates with QuickBooks Online and this integration allows you to easily sync customers, services, invoices, credit notes and payments. One of the biggest benefits of utilizing this integration is not having to re-enter data. Your data is synced directly from Teachworks – ensuring that your books are always up to date and giving you more time to focus on other areas of your business. Teachworks offers a simple email add-on that allows you to keep in touch with your clients. As your business expands and you have more resources available, you may want to enhance your email marketing efforts through beautiful email campaigns. MailChimp is a fantastic email marketing service that allows you to create visually appealing and captivating emails to send to your clients. Our MailChimp Integration allows you to sync students, families and employees to your MailChimp lists, making it much easier to send your email campaigns to your clients and track the results. Another great way to stay in touch with your customers is to send them a personalized email with all of their upcoming lessons. While this might sound time consuming, our Schedule Confirmation Add-On will allow you to automate the process completely. You only have to set up the schedule and Teachworks will take care of the rest. Whether you manage a small team or multiple teams across the world, this add-on will allow you to delegate tasks quickly and efficiently. You can quickly assign the task to a single employee or multiple employees at once and you can notify them of newly added tasks by simply selecting a checkbox. Keeping track of package balances can be tedious, even if you run a small tutoring business. Why not automate the process with the package balance alerts add-on? With this add-on enabled, you can receive an email alert if the unused hours in a package drops below a specified level. You can then take action and invoice your clients for more package lessons – quickly and efficiently. Another great feature that will save some serious time is our grade incrementing feature. In order to keep the grade levels listed on your students’ profiles up-to-date, you can update the grade levels for multiple students at once. Your student records will be updated in the background, giving you more time to focus on other tasks that require your attention. Teachworks offers invoicing solutions that simplifies billing and speeds up the process significantly, regardless of the size of your business. Whether you’re billing a single client, or multiple clients at once, the amount of time and effort required is the same. Invoices are created in the background, allowing you to focus on other areas of your business while Teachworks takes care of invoicing for you. Our Invoice Auto-Pilot Add-On allows you to automate invoicing entirely. If you want to review invoices before they’re sent to clients, you also have the option to save them prior to approval. Once you’re happy, you can approve and send all invoices at once. Teachworks also supports Invoice Due Reminders. With this feature enabled, you can send a reminder email to clients with unpaid invoices on the due date, automatically. We are fully integrated with Stripe and this close integration allows you to quickly and easily manage credit card payments. Your clients can easily pay their invoices directly from their mailbox, or login to their Teachworks account and select a their preferred credit card. Payments are automatically recorded and assigned to the relevant invoice in Teachworks. The integration also allows you to charge credit cards on behalf of your clients. We have recently added a Bulk Invoice Payments feature that allows you to charge credit cards in bulk, quickly and efficiently. The amount of effort required is the same for companies both big and small. Scheduling can be very time consuming, especially if you serve a big client base. Teachworks offers a myriad of ways to make scheduling less painful and more efficient for companies of all sizes. Repeat lessons: If you have students who have recurring lessons, you can schedule multiple lessons at a time with our lesson repeat feature. This feature will allow you to schedule a lesson once and will duplicate the lesson based on your settings. Pre-filled fields: If a student has a default teacher, service and location assigned to their profile, these fields will be pre-filled when the student’s name is selected when a lesson is being scheduled. Copy lessons: You may occasionally have a situation where a client wants to schedule a lesson that’s similar to another lesson. In this case, you can just copy the first lesson and update the time and date. Website Booking Plugin: Why not allow students (old and new) to book their own lessons? Our Website Booking Plugin offers two options – a “Join a Class” option for companies offering open classes, and a “Book a Lesson” option for companies wanting to allow students to book a single lesson. Both of these options can be enabled based on your service offerings. Profiles will automatically be created for new clients and lessons (if the “book a lesson” option is selected) will be added to the calendar for you. Lesson Requests Add-On: This add-on is a great time saver and it will reduce your workload significantly. With this add-on enabled, clients can login to their Teachworks account and request lessons – you only need to review and approve lessons. Join Open Lessons Add-On: If you offer open classes, you may want to consider enabling this add-on. The only admin required from you is to add the lesson to the calendar (you can set a student limit). Clients can easily login to their account, search for open classes and click on “join”. 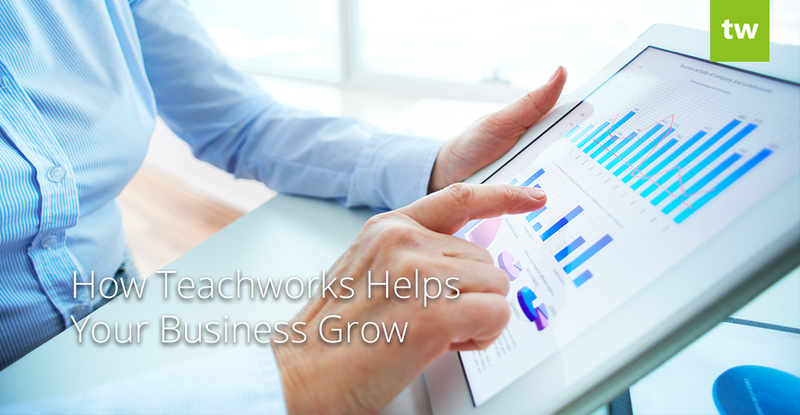 Teachworks enables you to manage employees and clients effortlessly. You can add as many client and employee profiles to your account as you require. Our bulk import feature allows you to import client and employee profiles in bulk. By using our templates, you can add profiles to Teachworks quickly and efficiently. Whether you are uploading a few records or several thousand records, the import runs in the background, allowing you to get started on other tasks. This feature can also be used to make changes to existing client or employee profiles in bulk. You can effortlessly update the status of multiple user profiles at once by going to the relevant user type (family, student or employee), selecting the relevant profiles by clicking on the checkbox next to them, and selecting the new status from the drop down menu that appears at the top of the page. As your business expands, you might find it increasingly difficult to manage client data and relationships. Fortunately Teachworks offers a number of ways that you can stay on top of it. You can add detailed notes to student lessons or client profiles. You can add a follow-up note and date to client profiles with our Follow Up Add-On. You can send personalized emails to keep your clients up to date with their upcoming lessons, announcements and more. Whether your business consists of a single branch or multiple branches scattered over the world, teachworks has a solution that allows you to effectively manage your business location(s). If you have multiple locations within your business and your teachers and students are not segregated by location, you can easily list multiple locations in your Teachworks account. You can break this down even further by adding sub-locations (such as rooms in a building) within a location . If your business has multiple locations, and these businesses all have their own manager, teachers, students and invoicing, you can create a master account and create separate Teachworks accounts for each location/branch. A master account will allow you to easily switch between the accounts for each of your locations and you can save default settings to use for setting up new location accounts. If you’re looking for affordable, scalable tutor management software why not give Teachworks a try? Sign up for our free 3-week trial to see if it’s a good fit for your business.